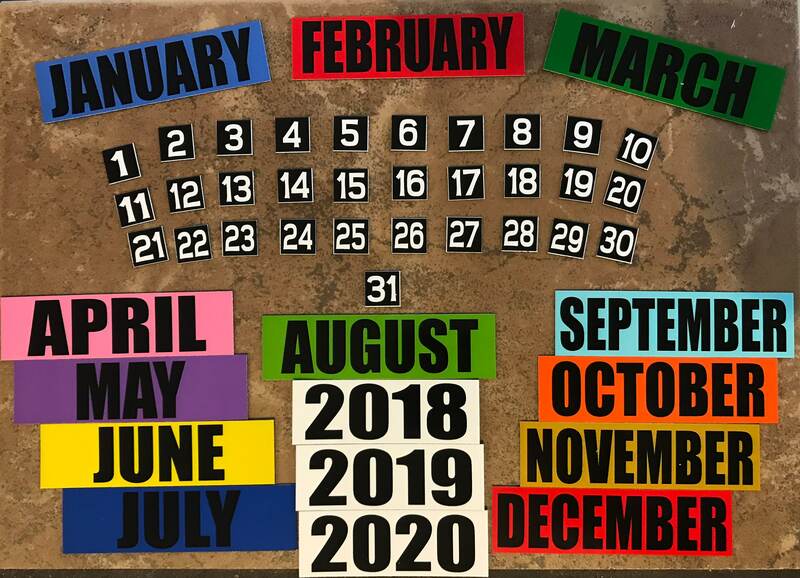 Calendar Magnets - Month/Year Set - Also Spanish French Italian Add ons Available! ~ Approximate Size: Months: 7/8" x 3 3/8"
~ Additional Sizes Available for Classroom Display! Use Custom Request. ~ Holiday Set and Customized Magnet Set Sold Separately. ~ Works with Magnetic/Dry-Erase Wall Calendar NOT INCLUDED. ~ Please let me know if there is something you want printed that you do not see. ITALIAN Large Full Calendar Set - MAGNETS - Great for Teachers and Classrooms! Perfection! The numbers are EXACTLY what I needed to make my calendar use more user-friendly. The magnets are good quality, fast shipping... I should have read the description and measured before ordering. They are too small for the white board I wanted to use them for... Maybe I'll re order custom sizes. Shipped very fast. Cute magnets & just the size I was looking for at a great price, but the magnets are very thin & aren't very strong. These are really nice! Very simple, easy to use and read. I use these to teach the calendar to my small children. Can't beat the price! I would love to purchase another set which includes the numbers for telling the date as well. Thank you so much! Wedding Planning Magnets - Set of 20 - Use on Calendar so you don't forget a date! Spanish Verb Conjugation Magnet Set! Great for the Spanish Classroom! Place Value Set - MAGNETS - Great for Teachers and Classrooms! Magnet of the Month Club - Subscription - Seasonal/Holiday Themes - The Gift that comes Every Month!